So here’s the mystery. I’m sure I posted this video ages ago. Back in June in fact. But there it was, when I went into my “Dashboard” (WordPressers all know what I’m talking about) sitting in the “Pending” category. So if you’ve seen it before, apologies, but not too many, as I’m sure you’ll appreciate the opportunity of seeing it again. I’ve since posted an article about Woodsy’s fine still imagery that you can check out here, if you missed that. From Manchester, England to Avignon France. And Back. 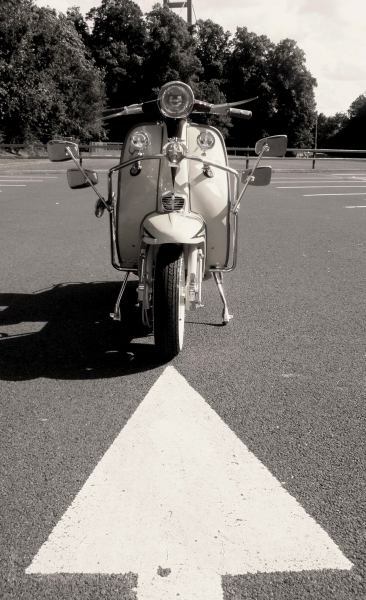 By Lambretta. If you only watch one video about EuroLambretta, watch this one. Brilliant visuals from the first frame to the last with a great soundtrack. Hit the full screen button, crank up your speakers to 11. If you don’t want to sign up for the next Euro after watching this, there’s something wrong with you. This is the best scooter video I’ve seen since this one. In fact, I think it’s better. Nicely set up shot by Adrian Hawkins of his lovely lammie “Lottie”, otherwise known as Crazy Banana. Taken at the Humber Bridge, (you can see a glimpse of it in the background) earlier this month. Via The Mod Generation site.